Kicked about riding a women’s specific bike after having ridden for a year on a MAN bike! 13 months ago on a warm morning I did a massive climb, a climb wait for it…. on the intermediate ring road flyover! Every pedal stroke was an added curse as Prem pushed me to go over and past that flyover! That was me on a mountain bike riding to get to breakfast, a total MIGHTMARE! I pushed myself with my riding, was fortunate enough to borrow Harsha’s lovely Trek 1.5, a road bike as he fell ill (“But I’m so glad you recovered Harsha”). That’s when an affinity to riding fast, strong and efficient began! 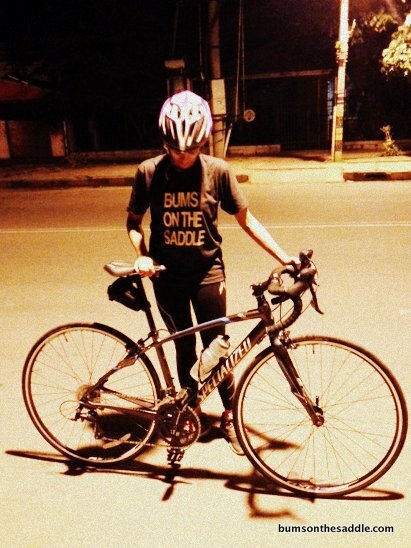 Its quite a feeling, zipping past folks with ease and agility, looking dainty on a road bike. Weeks after being busy at work and months after being a tad lazy (Harsha got better and took his bike back) I decided I had to have my own bike! A no brainer, I jumped on to a Specialized Road bike a few days back and I experience it for the first time on last night’s NIGHT RIDE. I’m completely blown away by the speed the bike gained as I pedaled with ease. Perfect for my physique, the smaller women’s specific handle bar ensures I’m not shoulder sore post ride. Having ridden around on larger frames in the last 13 months, each ride would leave my muscles tight and neck aching keeping me away from my bike and riding till I felt better. My new aspire helmet had hair management sorted! The pony-tail sat high streamlined through the hairport (read more) on my helmet. If you’re a sweaty rider, you’d love this as it keeps your hair off your neck, staying cool! The single adjustment strap is another plus.The rotating dial controls the fit on the crown on my head. Snug, safe and sorted! A Sore Bottom (yeah, intentional capitals) personally is a deterrent while cycling. The pain/agony on the last leg of a 80km ride caused by sitting on your bums for too long was something I thought was meant to happen. Going by the saying “No Pain, no Gain”! Or so I thought… quite kicked to put my women’s specific saddle that apparently is engineered to my sit bones(bum bones) to test on a longer ride! Clocked in a 27.4km ONLY. Although a shorter ride Looking to ride a lot more!